Pleasant Meadow Manor hosted a Paint Nite event at the Norwood long-term care home April 25 which saw 20 participants attend. The event proved to be a win-win for Pleasant Meadow Manor, as the Paint Nite raised $300 for residents’ council and increased the home’s exposure in the community, says life enrichment co-ordinator Chris Garden. Paint Nite events are led by a trained artist who guides attendees through the process of creating a piece of artwork. 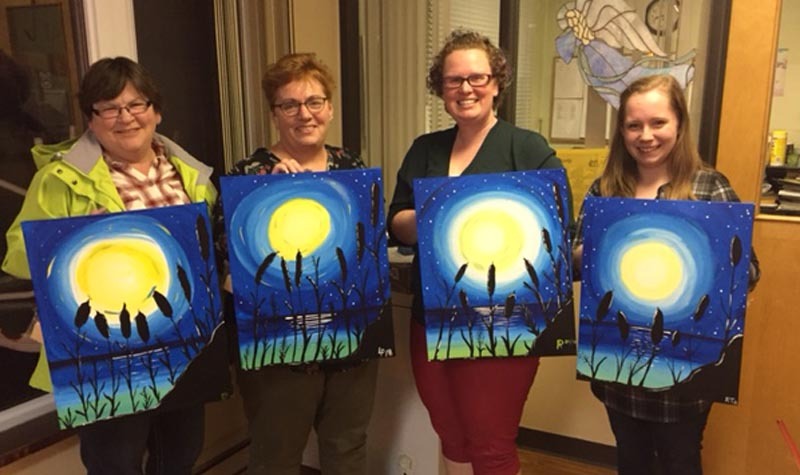 The Pleasant Meadow Manor Paint Nite saw attendees paint a moonlit sky over a marsh. The Pleasant Meadow Manor team announced the event at a mental health for seniors workshop long-term care homes in the region attended in March, Chris notes. “Everyone had fun,” she says. Paint Nite events are held internationally. The events often raise money for causes while encouraging people to explore their artistic talents.